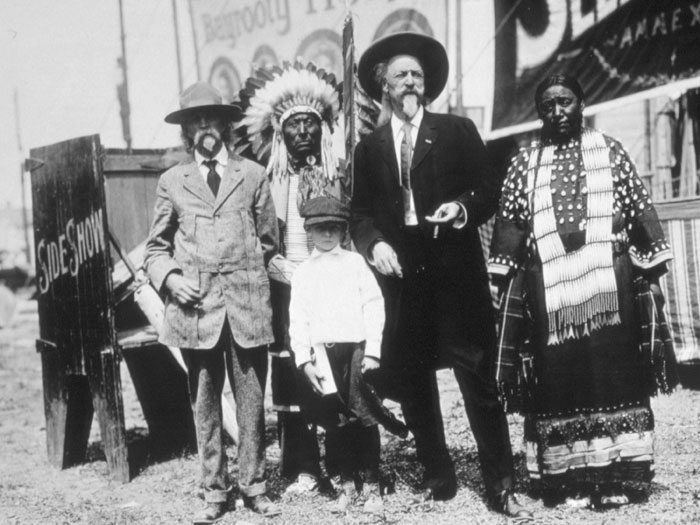 Edgar Samuel Paxson arrived in Montana in 1877, the year after the Battle of the Little Bighorn. 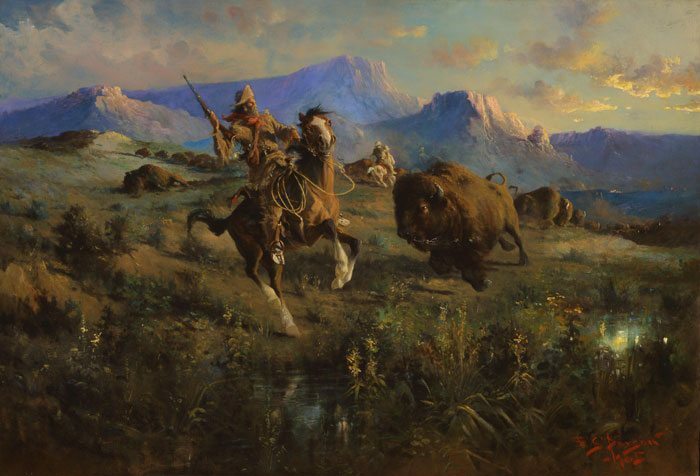 Paxson’s interest in the battle would become a defining element in his artistic career, culminating in his major work, Custer’s Last Stand, now in the collections of the Buffalo Bill Center of the West. According to the biography written by his great-grandson, Paxson interviewed Native Americans who had been in the battle, such as Gall (Lakota) and Two Moon (Tsistsistas), and some ninety-six soldiers from the related campaign. His primary source was General E.S. Godfrey, who had been a lieutenant with Captain Frederick Benteen’s contingent and who had been one of the first to view the site after the battle. Actual work on the canvas, which measured six feet by nine feet, probably began in 1895. The final work includes more than two hundred figures. Click here to see a larger view of the painting and zoom in on individual figures. 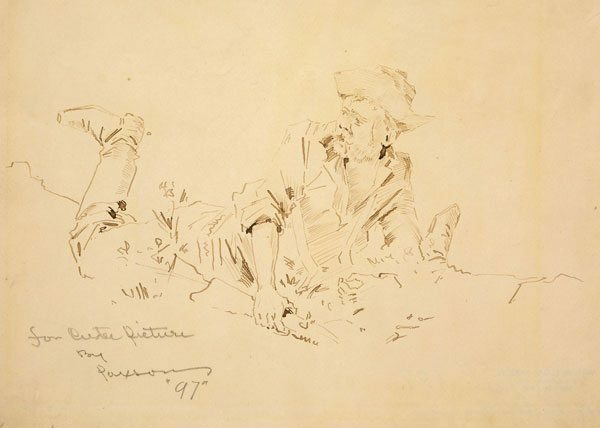 In May 1898, Paxson’s work was interrupted when he was mustered into the Army and sent to the Philippines for active service during the Spanish-American War. Back home after a year, he resumed work on his painting and completed it in 1899. Paxson and a business associate sent the painting to Eastern cities for an exhibition tour, charging the public twenty-five cents to view the painting. They produced a booklet to accompany the painting, which included an outline key to the figures, a history of the battle, and information on the painting. 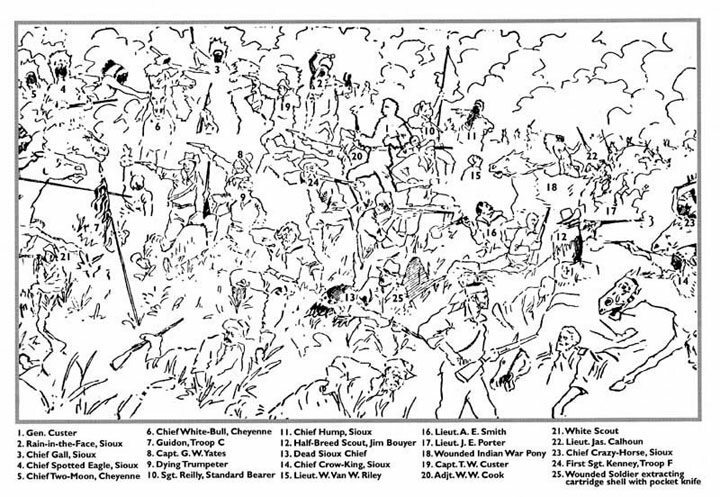 In the booklet the painting was titled Custer’s Last Battle on the Little Big Horn, but when Paxson copyrighted it in 1900, he used the title Custer’s Last Fight. Family members have said, however, that the artist used the title Custer’s Last Stand in the latter part of his life, and it has become the generally accepted title. Having been elected to membership in the Society of Associated Arts, Paxson traveled to Chicago and exhibited his paintings in the organization’s annual exhibition in 1903. He spent at least seven weeks in the city, where he visited several museums and spent time at the Chicago Academy of Fine Arts. Although he seems to have been primarily self-taught as an artist, he might have had some instruction in Chicago and he took opportunities to learn by looking at the works of other artists. Paxson exhibited paintings at the Louisiana Purchase Exposition in St. Louis in 1904, and the Lewis and Clark Exposition in Portland in 1905, as well as other venues outside Montana. He moved to Missoula, Montana, in 1906. In 1911, he was commissioned to paint six scenes of Montana history for the Senate chambers at the Montana Capitol in Helena. The following year, he was commissioned to execute eight paintings for the Missoula County Courthouse. Edgar Paxson died November 9, 1919. 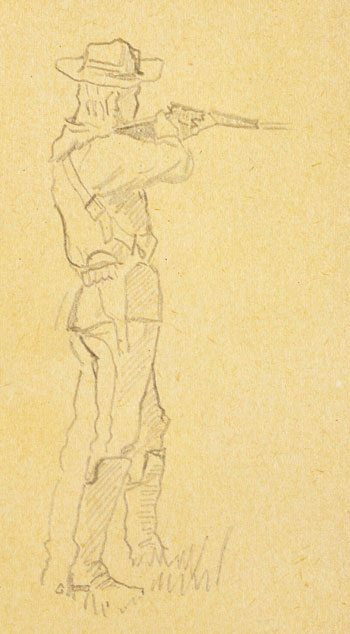 Other works by Paxson in the Buffalo Bill Center of the West include The Buffalo Hunt, 1905, and a group of fourteen drawings related to Custer’s Last Stand. 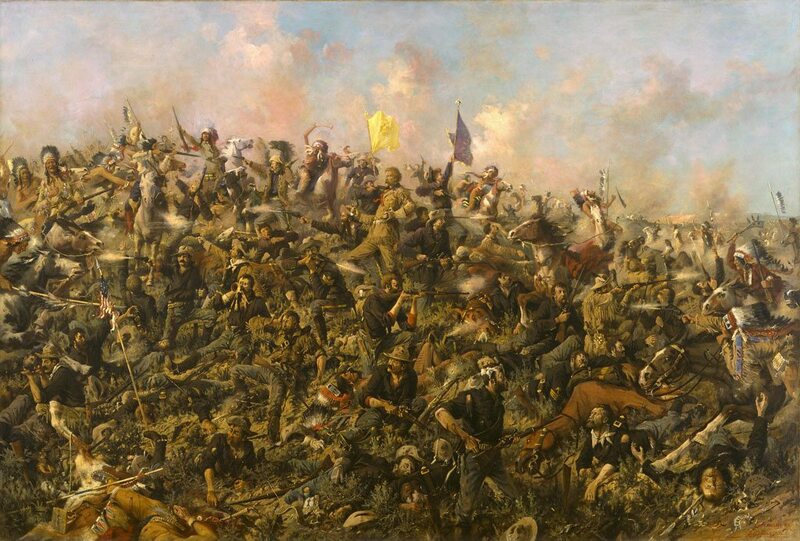 *Paxson, Edgar S. Paxon’s Great Historical Painting of Custer’s Last Battle on the Little Big Horn in Montana, June 25, 1876. Peoria, Illinois: Frans & Sons Print., [ca. 1900]. Paxson, William Edgar Jr. E.S. Paxson: Frontier Artist. Boulder: Pruett Publishing Company, 1984. The most comprehensive work on Paxson. Written by the artist’s great-grandson. Stenzel, Franz R., M.D. E.S. Paxson—Montana Artist. Montana Heritage Series, No. 14. Helena: Montana Historical Society Press, n.d. Reprint of an article in Montana: The Magazine of Western History, Autumn 1963. Supplanted by more recent biography by W.E. Paxson Jr., but provides another view of the artist.